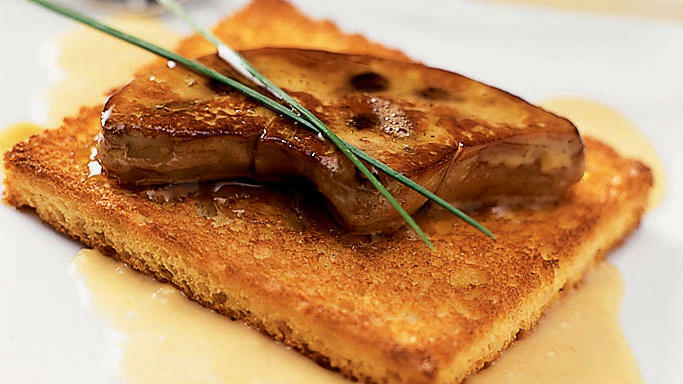 Once a rarity, foie gras is now on even moderately upscale menus. And ducks are being reared in this country for their fat, oversize livers ( foie gras de canard, in French). Prepared at home, foie gras is a relative bargain. A whole duck foie gras weighs 1 to 1 1/2 pounds, and 3 ounces makes a generous first-course serving. Polarica in San Francisco (800/426-3872 or www.polarica.com) ships whole livers (grade A, $35 to $38 per lb. ; grade B, about $30 per lb. ― both are fine for sautéing). At an upscale meat market or fancy food store, the price is higher, but you can usually buy a portion of a liver. A whole liver has two lobes. To clean them, gently pull them apart and pull or trim out any veins. To sauté foie gras, keep it cold until ready to cook, cut it into fairly thick slices, and then sear it quickly over high heat to brown lightly. Foie gras is so lavishly rich, it tastes best with powerful beverage partners, such as an intensely sweet, high-acid French Sauternes or a late-harvest white wine.